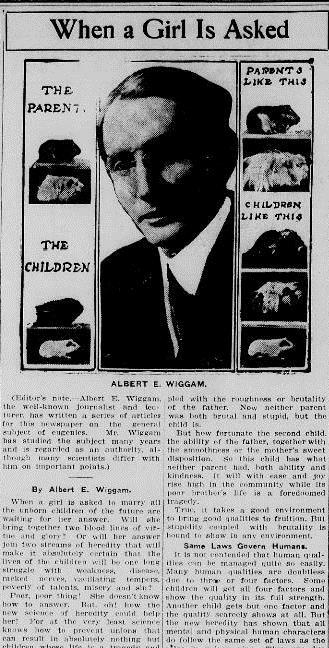 Eugenics proponent Albert E. Wiggam used guinea pigs to illustrate traits passed from parents to offspring. “Imagine these little fellows human beings. And suppose the blackness of the mother were imbecility and the smoothness represented kindness of the heart. Let the whiteness of the father represent business … ability and the roughness a brutal disposition.” Read the article, published in the Missoulian, February 14, 1914. Montana institutions began sterilizing selected inmates in the 1910s, but it was not until 1923 that the state legislature created the Board of Eugenics to regulate the practice. The law establishing the board stressed that eugenic sterilization required consent—either from a legal guardian or next of kin or, barring that, from the board itself. The first board, which included several doctors, among them noted Butte physician Caroline McGill, distanced itself from eugenics’ most avid proponents by stressing that sterilization was not to be used as “a punitive measure” but for the “betterment of . . . inmate[s] or to protect society.” The board required that sterilizations be performed only at state institutions: primarily, the State Hospital for the Insane at Warm Springs and the State Training School at Boulder, both custodial establishments for those with mental disabilities. Though in theory the law applied equally to both sexes, in application it disproportionately affected women. Of the 256 Montanans legally sterilized between 1923 and 1963, 184 (or 71 percent) were women. It also disproportionately affected the poor and the unmarried. The first three Montanans sterilized were unmarried “imbeciles” committed to the state hospital multiple times for pregnancy out of wedlock. The hospital staff suggested that, once sterilized and released, none of the women would return because they were capable of supporting themselves; sterilization prevented their readmittance and relieved the state’s burden of caring for the women’s children, all six of whom were “deficient mentally” and some of whom were already in state custodial care. 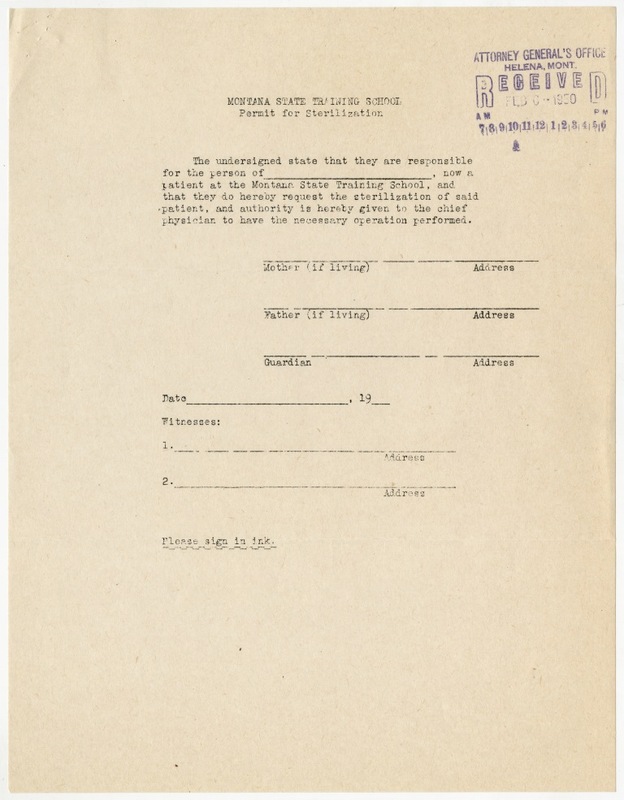 This fill-in-the-blank form, dated February 2, 1950, required only the signature of one legal guardian in order to authorize the sterilization of a student at the Montana State Training School at Boulder. Click image to enlarge. MHS Archives RS 76 Box 39 Folder 2. By passing eugenics laws, state officials gave themselves the power to control reproduction, and prejudice often influenced their decisions. In 1927, the U.S. Supreme Court ruled in Buck v. Bell that forced sterilization was constitutional, infamously declaring that “three generations of imbeciles are enough.” However, the classification of “imbecile” often included women who committed petty crimes or were promiscuous. Drug addicts, the homeless, and the unemployed also found themselves targets of eugenic sterilization laws. So did members of Indian tribes. In the 1970s, women from reservations across the United States discovered that, during the course of standard medical procedures, they had been sterilized without their consent by doctors working for the Indian Health Service (IHS). In Montana, three anonymous women from the Northern Cheyenne Reservation filed a class action lawsuit (ultimately settled out of court) alleging forced sterilization without their knowledge. According to a federal investigation, between 1973 and 1976, the IHS sterilized 3,406 American Indian women without their permission, intentionally targeting full-blooded Native women for the procedure. At the same time, IHS policies failed to address other health concerns on reservations, including high infant mortality rates. American Indian activists called the sterilizations genocidal. Erasing reproductive ability, many claimed, was an effort to erase the tribes themselves. Interested in the politics of reproduction? Read earlier posts to learn more about the history of abortion, birth control, and midwifery. “Annual Report of the Board of Eugenics.” Montana State Board of Eugenics. Helena, 1972. Chamberlain, Chelsea. “Montana State Training School Historic District National Register Nomination Form.” Draft. On file at the Montana State Historic Preservation Office, Helena, MT, 2014. Dillingham, Brint. “Sterilization of Native Americans.” American Indian Journal 3, no. 7 (July 1977), 16-19. Johansen, Bruce E. “Sterilization of Native American Women.” In Encyclopedia of the American Indian Movement. Ed. Bruce Johansen. Santa Barbara: Greenwood, 2013. Josefeson, Deborah. “Oregon’s Governor Apologises for Forced Sterilisations.” British Medical Journal (December 14, 2002), 1380. Kaelber, Lutz. “Eugenics: Compulsory Sterilization in 50 American States. Montana.” University of Vermont, Sociology Department, 2011. Kluchin, Rebecca M. Fit to Be Tied: Sterilization and Reproductive Rights in America, 1950-1980. New Brunswick, N.J.: Rutgers University Press, 2009. Larson, Karmet. “And Then There Were None.” Christian Century, January 26, 1977, 61. O’Sullivan, Meg Devlin. “’We Worry about Survival’’: American Indian Women, Sovereignty, and the Right to Bear and Raise Children in the 1970s.” Ph.D. dissertation, University of North Carolina – Chapel Hill, 2007, 64-65. “Patients Mistreated and Mutilated by Illegal Operations at Insane Asylum While Relatives Are Forced to Pay Exorbitant Charges to Superintendent.” Helena Independent, October 5, 1924. Paul, Julius. “Three Generations of Imbeciles Are Enough…” State Eugenic Sterilizations Laws in American Thought and Practice. Washington, D.C.: Walter Reed Army Institute of Research, 1965. 404-407. “People and Events: Eugenics and Birth Control.” PBS Web, October 1, 2014. Rubin, Nilmini Gunaratne. “A Crime against Motherhood: Involuntary Sterlization Was a Horrifying Exercise in Genetic Engineering.” Los Angeles Times, May 13, 2012. Schultz, Louisa Frank. “Sterilization for Those Involved in Mental Retardation History, Issues and Options for Montana.” Montana Developmental Disabilities Planning and Advisory Council, 1986. __________, and Anne Moylan. “Further Consideration of the Question: Should Montana Have a Public Policy on Sterilization of Those Involved in Mental Retardation and If So, What Should It Be?” Montana Developmental Disabilities Planning and Advisory Council, 1987. “16 Helpless Human Beings Are Said to Have Been Unsexed at Hospital.” Helena Independent, April 24, 1924. Wiggam, Albert E. “Death Rate after Forty Increasing.” Daily Missoulian, March 30, 1914. ________. “When a Girl Is Asked.” Daily Missoulian, February 14, 1914.